The test is now closed. The prizes have been won. See here for details. 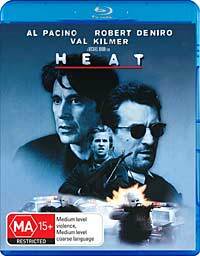 Courtesy of Warner Bros, from 30 October 2009 I have three copies on Blu-ray of the excellent movie Heat (1995) to give away. This is a must-have, not only for the excellence of the movie, but the superb street gun battle and airport scenes, presented in lossless Dolby TrueHD 5.1. The winners will be the first to email me the correct answers (explained below). In the event that I don't receive completely correct answers within a reasonable time (I don't want to set a date yet, since I lack experience of how this will work, but probably a couple of weeks) I shall bring the competition to a halt and give the discs to the most correct. This is open to Australian residents only, but obviously excludes the usual categories, such as professional and family associates. However I would encourage all who may be eligible to receive the disc to participate in the challenge anyway. I want to have as many people as possible try to work out which is which. 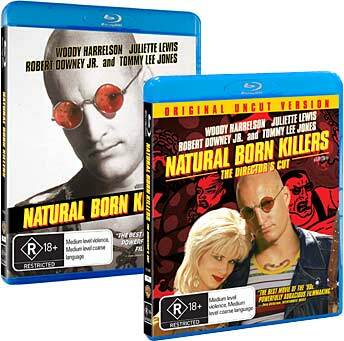 With this test I present two different versions of the famous 1994 Oliver Stone movie, Natural Born Killers. Warner Bros Entertainment Australia Pty Ltd actually released two versions of this movie on Blu-ray in 2008 and 2009. First came the standard theatrical version, and then more recently the extended 'Director's Cut' version. The former is 118 minutes and 57 seconds long, while the latter is 122 minutes and 3 seconds long. Two minutes of the latter were apparently excised to allow the movie to be released in US cinemas with an 'R' rating. Re-inclusion of them basically adds to the violence. The frames I've selected for comparison are, obviously, from parts of the movie not altered. However that doesn't make them directly comparable. There are two major differences. First, it was immediately obvious that the film prints from which the two versions were telecined were quite different to each other, with different noise characteristics, slightly different framing, and even slightly different aspect ratio distortion. They were encoded very differently as well. I used the excellent BDInfo 0.5.2 and 0.5.3 programs to extract data from the discs, including video bitrate information for the two versions. Both used the VC1 compression format, but the Theatrical version enjoyed a very healthy 27.75Mbps average video bitrate, while the Director's Cut received a far more modest 20.02Mbps. To reduce the variables in the comparison, I cropped both frames to as close a match to each other as possible. Each frame, as presented, has all four edges lopped off, reducing them in size from 1,920 by 1,080 pixels, to 1,800 by 1,000. The frames were extracted using the same application, and were written in the lossless *.png format. That is how they are presented here. Each pair of frames is contained in a Zip file, and you can download the ten zip files below (in Windows, right click and choose 'Save As ...'; in other OSs, you know how). Download all ten, unzip them and compare the 'A' and 'B' versions of the frame. I randomised them, so some of the Theatrical version frames are 'A' and some are 'B', and likewise for the Director's Cut version. (No, that isn't the answer!) Email me by clicking on this link, then copying the above block into the email and, of course, changing the As and Bs to what you think the answer is. Please don't send more than one. This is not a proper scientific test of the kind from which firm actionable conclusions could be drawn. However it will yield some information, mostly about you the readers and participants. So let's see how you go!